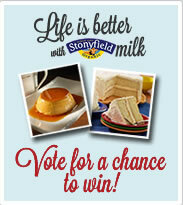 Vote For Me in the Stonyfield Farm Recipe Contest!! Stonyfield Farm invited its blogger brand ambassadors, Yo-Getters, to participate in a recipe contest. I thought it sounded like fun, so I was game. I'm always up for a good throw down every now and again. I was sent the required item for the recipe from Stonyfield: organic whole milk along with my recipe category: desserts. Oh, yeah! Just my thing: DESSERTS!!! I chose my dessert, Tres Leche Cake, a delicious moist cake prepared with 3 different milks. It's mouthwatering, rich, tasty, and downright irresistible. But now it's game time, and I need your help. Starting today, December 6th through December 12, you can vote daily on Facebook for my recipe. And of course, I'd be totally grateful if you did. For each entry made, you are entered to win a $1,000 gift card to Cooking.com. Even you benefit for placing a vote!